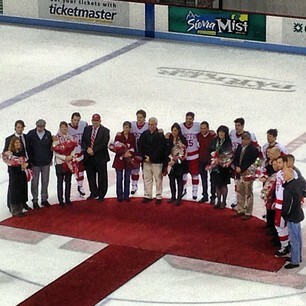 Terriers concluded the regular season with a convincing Senior Night win at Agganis Arena, shutting out Northeastern, 5-0 and earning the third seed in the Hockey East tournament. Freshman goalie Sean Maguire (photo) registered his third shutout of the season, lowering his goals against average to 2.72 and improving his save percentage to .919. With Providence losing to regular-season champion Lowell and New Hampshire taking just one point from its series with Maine, BU, PC and UNH all finished with 32 points; Terriers won the tiebreaker based on having the most conference wins and so get the third seed, followed by the Friars and Wildcats. CORRECTION: BU earned the third seed due to having the best record in the six games against the other two: 3-2-1. Terriers will host Merrimack in the Hockey East quarterfinals (pairings), beginning Friday night.All Hockey East quarterfinal games will be streamed on Hockey East Online TV (subscription) except those to air on NBC Sports Network and NESN. Those games will be announced later today. Check back for details. BU, which has now won four of its past five games, got the only goal it would need from freshman Danny O’Regan, on a first-period power play with assists to linemates Matt Nieto and Evan Rodrigues. Following a scoreless middle period, BU doubled its lead 1:12 into the third period when Rodrigues converted an O’Regan pass from behind the Huskies net. Midway through the period, Matt Nieto grabbed his own rebound and scored his team-leading 16th goal of the season for an extra-attacker goal on a delayed penalty. Less than a minute later BU scored a second power play goal with Matt Grzeylcyk’s slick pass sent Sahir Gill in alone on NU’s Clay Rawlings. Matt Ronan, filling in for injured defenseman Garrett Noonan, picked up his first collegiate point when his wrist shot was tipped home by Gill to close out the scoring. Earning first-star honors was O’Regan, with a three-point night, tying him with NU’s Kevin Roy for a most points by a Hockey East freshman with 34. Maguire, who stopped all 25 Husky shots—and 56 of 58 for the weekend series—was second star and Gill with a pair of goals took the third star. BU Blueliner Sean Escobedo, who earned kudos from Jack Parker for his strong d-zone play, assisted on two of the third-period goals and now has 11 points, becoming the 12th Terrier to reach double-digits. Nieto has seven goals in the past four games and 13 since second semester began. Freshman Sam Kurker was snake-bit last night, hitting the post three times. Two BU All-American defensemen, Washington Caps' Tom Poti and NY Rangers' Matt GIlroy go head-to-head on the NBC national broadcast this afternoon. #4-ranked and top seed BU broke open a one-goal game with three scores in the middle period and rode 42 Kerrin Sperry saves to a 4-0 blanking of Providence College in the Hockey East Tournament semifinals. BU will meet Northeastern, an upset winner over second seed Boston College, in the tournament championship game today at 1 p.m. NESN will air the game on tape delay at 4 p.m.
Terriers took a 1-0 lead on a late first-period power play when Sarah Lefort’s 20th goal was set up by Marie-Philip Poulin, who then kicked off the second-period flurry, just 19 seconds in, shorthanded and unassisted. Louise Warren extended the lead six minutes later, assisted by Isabel Menard and Caroline Campbell. Then late in the period, Warren scored again with helpers by Menard and Kathryn Miller. The win, BU’s fourth of the year against Providence, brings the Terriers’ record to 25-5-3. BU also swept the three Hockey East games against Northeastern this year, but fell to the Huskies in the Beanpot opener, 4-1, in their most recent meeting. Going into today's title game, BU have five of the conference's top nine scorers in Hockey East games: Poulin, Menard, Jennelle Kohanchuk, Lefort and Warren.